January 24 is the UN International Day for Education. 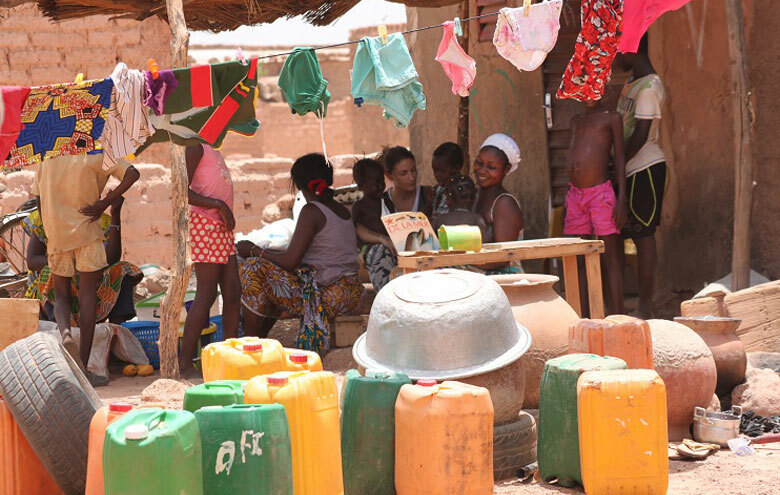 ATD Fourth World has worked for many years in Burkina Faso. 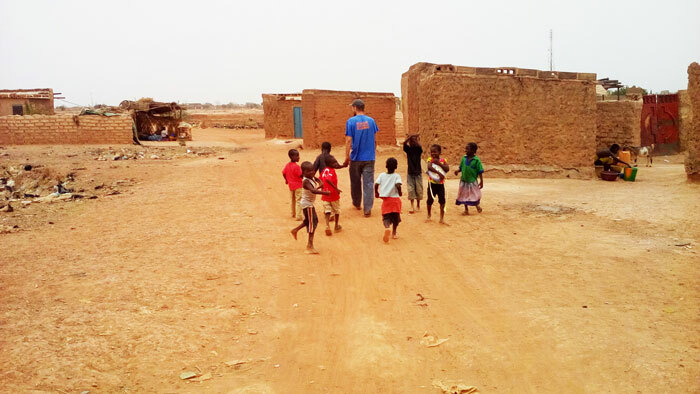 In this article, ATD Fourth World Volunteer Corps member Sylvain Lestien describes how he reaches out through a book lending program to children who live in the street and other families in poverty. 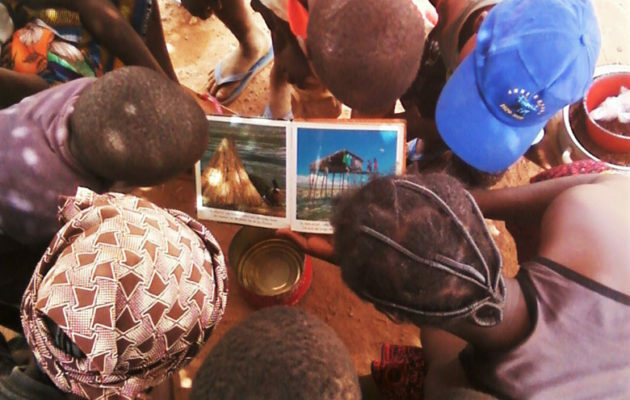 For many marginalized people, having access to books in this way is the first step to participating in other education programs. Early morning in Naag Buuden, on the outskirts of Ouagadougou, finds me in Suzana-Ma’s courtyard, which is an open area full of people coming and going. You feel as if you are in a public place – except for the way people make you feel welcome. After giving Suzana-Ma and the children a bit of time with the book, I sit and help a few children who are unable to go to school with some of the basics of reading and writing. I deliberately don’t use any books or other aids – so that the watching parents can see that to have them is not essential, and are encouraged to pass on what they know even if their time at school ended with the preparatory class. When I go, I leave the book with Suzana-Ma. Children come to look at it every day, as do some of their parents. Suzana-Ma gives back the book I left with her the previous week, and I take it with me as I head for the other side of Naag Buuden. This is where I started two years ago. A child who was sleeping rough in the centre of town agreed to introduce me to his father. He was living in poverty, surrounded by numerous others enduring the same misery. So to help the children I started making regular visits to the area. These visits have now become a bit of a ritual. My first port of call with the book is Madame Awa. She reads it to them and then I take the children for a walk. They retell the story in their own words to everyone we bump into as we make our way through the narrow streets and alleys. 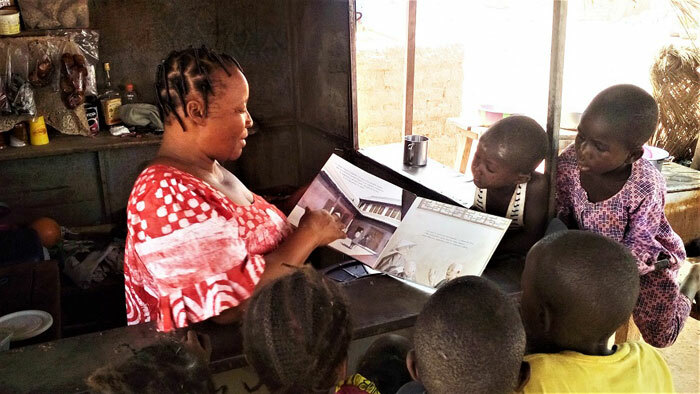 Ms. Awa pauses in her work to read to the children. We come across almost no men; they have all gone off to town to try to find food for their families. I have been trying to get the mothers and children to sit down with the book on their own, without me. Most of the women don’t speak French and most can’t read either. But some can, and they read to the others, whilst everyone has something to say about the pictures. Factual books work best; everyone shares what they know, and I do my best to keep a low profile. It’s often not until the mothers have got all they can out of the book that they make time to share it with their kids. Book time is thus a time to meet, a time to talk, a time to share knowledge and experience…. a time to give of oneself. But some mothers prefer to spend time with the book alone, to give themselves a quiet moment in their busy lives for thinking about culture and other topics. 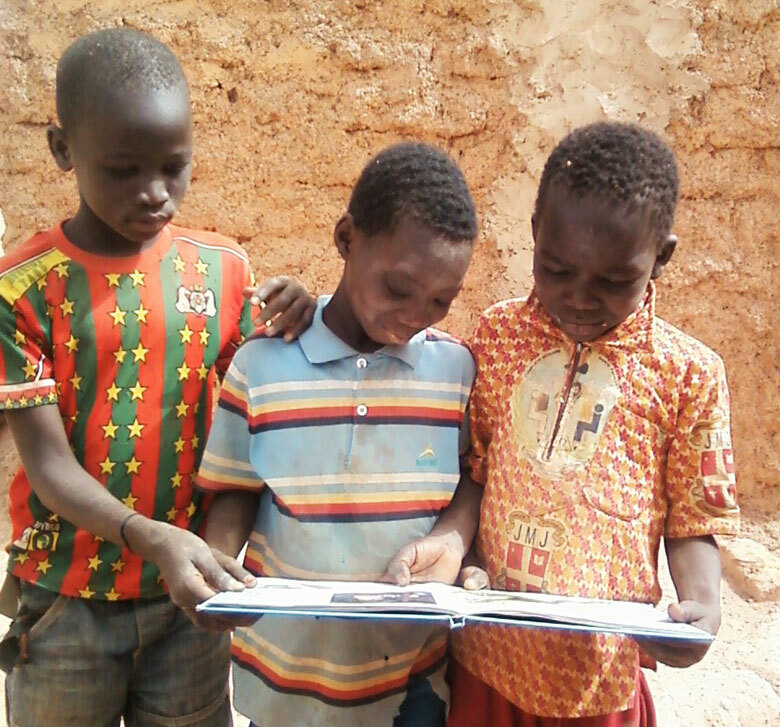 The children of the neighbourhood gather around a book. On one of my very first visits two years ago I met Ba-Victor in a local bar. He showed me two children’s books that he owned. So ever since I have left that week’s book with him when I go. Ba-Victor’s job is to mend bicycle punctures, so he is out of doors all day. Everyone knows him and where to find him. So anyone who missed out because they were at school can stop by and spend time with the book, as can those who simply want to take a second look at it, to show it to a friend or to borrow it. 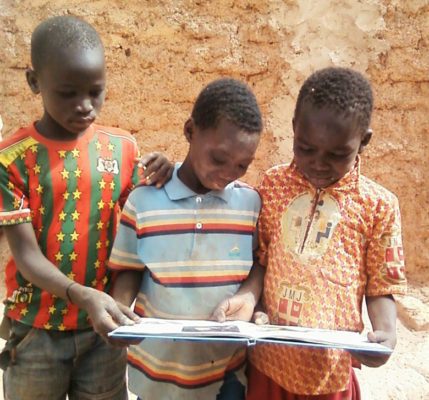 Accompanied children, Sylvain goes around the neighbourhood to offer books to those he meets. Book lovers in the neighbourhood, and there are lots of them, have already enjoyed more than 60 books!